It’s Megane Day! I wasn’t going to let this chance slip to create a post so here we are. This is actually a really fun and cool idea that Mel came up with and of course, I had to hop on because why not? You can read her original post here. I’ve decided to dedicate my post to Maes Hughes because that’s the first person I thought of when I remembered that I still hadn’t written this post. (Yeah, I’d forgotten and remembered at uni hence it’s coming out in the evening with a whole lot of other posts) Hughes is a great guy and a loving father and well, here goes my post for him! Hughes was the first big character death in FMA and FMAB that really felt like a blow because he was just an all-round wonderful guy. Whilst he doesn’t get much time on the screen, his death, memory and what he discovered all have a lasting effect on the characters and the events that follow. It’s as if, though not present, he is still intertwined in the events that occur. It just goes to show that he didn’t die for nothing and that, he was still essentially “living” at least in the acts and in the memories of the other characters, especially Mustang. Hughes’s death came because he got too close to the sun hence he burnt. As an investigations officer, I can see why he couldn’t keep clear of what the Elric brothers were looking into and really, to some degree it tied into his own investigations on Scar. What’s interesting about Hughes is that he has a sharp mind and I don’t see him anywhere but with his head in a book or looking at maps and whatnot. He is a great researcher and has a sharp mind which allows him to see the bigger picture and connect the dots. In any other investigation or job, this would be amazing but, it is also fatal to him. He was able to connect the dots way too quickly with this instance which meant he learnt what was going on with the homunculi and how long this plan was in motion before anyone else and that’s what, essentially, got him killed. ereffects or the trauma that came from the war, but that he simply hid it away into the recess of his mind for the sake of his family and the life he now had. I think this takes a lot of power and strength to do and that makes me respect his character all the more. However, I think all of you will agree me on this one – the best thing about Hughes is how he dotes on his daughter and spreads that love to the Elric brothers as well. Hughes is quite the father and Elicia is a lucky girl to have known him as her father, even if he didn’t stick around for long. He cherished her and boasted about her to everyone! I just love that about him. He was a proud father and was not afraid to share that with everyone. Considering his job, one may think that’s risky but the fact that he doesn’t care just goes to show how much he loves his wife and daughter and wants to show them off. Honestly, the relationship between Hughes and Elicia was the purest and cutest thing this show had. In the middle of all that dark despair, their relationship was very comforting to watch. For me, knowing that Hughes could have been the father figure the Elric’s never truly got to experience, and an amazing father to Elicia as well was probably what made his death ten times worse. The nicest guys always tend to catch the short end of the stick and that was especially the case for Hughes. Still, he played a crucial role in the show because without his death, Mustang wouldn’t have been motivated and the dots would not necessarily have been connected at the end. I was thinking about him as well yesterday and it made my heart hurt. I think his is one of the deaths that affected me the most in anime. Awhh! Same here. I don’t think I’ve ever cried or been so shocked at an anime death as much as I was when I first saw it. 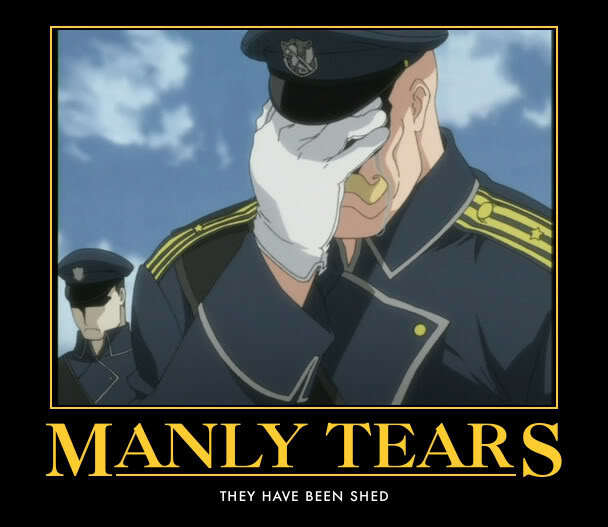 Oh man, Maes Hughes death in the original FMA hit me harder when I rewatched it. It’s one of the moments in anime I never forgot about. I Maes Hughes a lot, and wasn’t expecting to die at all. That funeral scene with his daughter is still tough to see for all the right reasons. It was through my second viewing of the original FMA that I notice some tears running down. It was unexpected, but at the same time it’s packs quite an emotional gut punch even though I knew it was going to happen. That’s so true. His death is quite iconic and unforgettable really. That funeral scene had me a blubbering mess especially when I rewatched it. Knowing it was coming doesn’t prepare you in the least. It’s really sad but also very powerful. Such an emotional moment in the series, and great post on Hughes! I like your implied analogy between Hughes and Icarus. It’s worth pointing out that whereas Icarus’ death from flying close to the sun is seen as the result of a fault on his part, for Hughes it’s the result of his virtues and selflessness that lead to his demise. Arguably the survivors in the story are those who were good but also had room grow: those who died were the bad guys and the one man so good he had little room left to get better. That’s true. I took it more as, both – one knowingly, the other unknowingly – went too close to danger for their own good. But what you said is also true. For Hughes, his own personality was his doom. That’s so true. It’s a perfect summation really. Good Choice!!!! Great post. Happy Megane day to you! Hughes is a fantastic character, and you are right that the nice guys always get the worst of it. It would have been nice to see how Ed and Al might have changed if they’d had Hughes’ influence around throughout the rest of the story, but Hughes’ death is such an iconic part of the story it is hard to imagine it not happening. Thanks for sharing a great character for Megane Day. He sure is. That’s true. Whilst I’d love to see how he would have influenced the Elric brothers, his death was pivotal to the plot and I can’t see it any other way. It’s kind of ironic that. Aw, reading this made me a bit emotional. He was my favourite character in the series and when he died, the shock was too much. I sobbed so much. This is a lovely post. Brings back all of his happy vibes and love for his kiddo. Awhh I didn’t mean to make you emotional!! Same, I love his character and his death was such a shock.